India art paintings are some of the world's most beautiful! They often depict gorgeous and serene images, through use of thoughtful color. 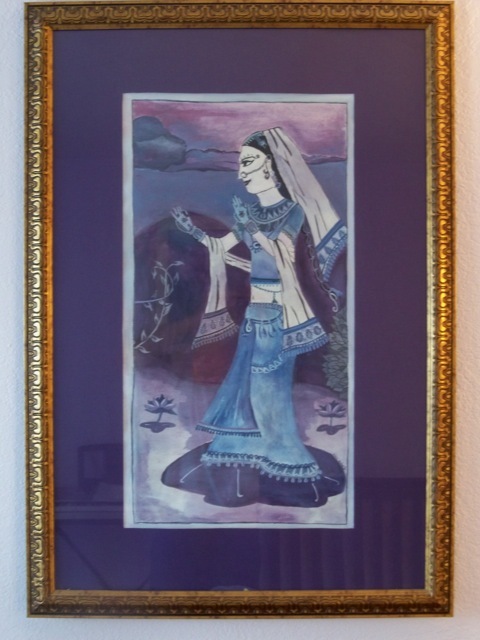 My family and I are big art lovers, and we have purchased and proudly display beautiful Indian paintings in our homes. I own one that I love in particular from Painter Hahn in the city of Kombath; you will see it below. 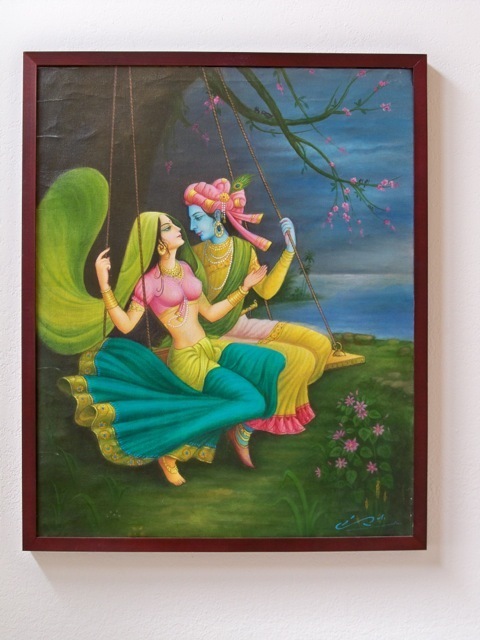 In this painting Lord Krishna, the supreme Hindu lord, is seen sitting on a swing with Radha, the supreme Hindu goddess, and they admire one another. If I look carefully in the tree above them, I can see two love birds snuggling close up high. I absolutely love the bright colors used in this painting. Indian people tend to wear their emotions on their sleeves, and Indian artists clearly communicate a lot of feeling and expression through their art work. The emotions an artist feels can usually be depicted and interpreted universally from his or her painting by an admirer of their art. To me, the fact that we can all feel what an artist intends for us to feel, says that the piece was well executed. A lot of Indian paintings depict famous deities, or scenes from famous stories. Other paintings tend to depict the rich everyday culture of India. For example, one of the most beautiful paintings I've seen was of women carrying water jugs over their heads as they walked in traditional garments. It told the story that the women had walked together to the nearby river to collect water for their families, or perhaps a small village. As with any painting from any culture, the value of Indian paintings is in the eye of the beholder. In other words, everybody is different, and we all find different aspects of art that speak to us personally. Check out some Indian paintings and find the ones that touch you, or that you adore most! Leave India art paintings to discover more India Art. Discover more about India's culture.